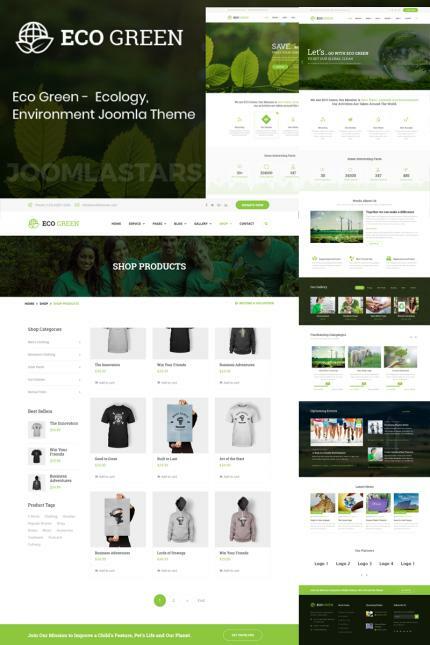 Eco Green Joomla template is a perfect solution that lets easily create a ecology related website like any recycling business, alternative energy sources distribution, environment preservation, fundraising, ecology, energy, environment, environmental, recycling company, green, green business, green tech, health, hydropower, jungle, life, sustainable, natural, nature, ngo, non-profit, water heater, organic, recycling, renewable energy, shop, solar, solar energy, wind power, organic & biology related websites, etc. This theme comes with necessary features for your online presence like about us, team, 404 page, filterable gallery pages, multiple blog layouts, online shop, testimonial and FAQ page etc. Eco Green can be a great choice for your online presence. Build your company website easily with the Drag and Drop Sp Page Builder Pro.